Knit Whimsy: Wait...what? What month is it? Wait...what? What month is it? In the name of all that is yarny and good, I swear it was September 1st just a few days ago. Nearly two months since my last post. How sad is that? Don't answer. I actually have been knitting during that time. First, baby things!! Woo hoo! 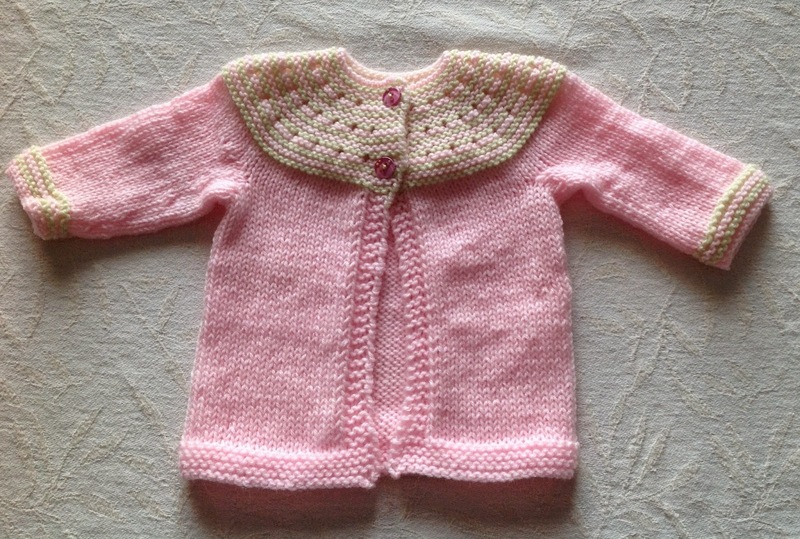 The pattern is Gidday Baby by Georgie Hallam. I liked the pattern, even though I had trouble with an underarm. This is routine for me, I seem to always have difficulty picking up enough stitches and closing the gaps under the arms tightly enough. For this project, I had to completely pull out one sleeve and start again because it just didn't look right. It doesn't lay well in the picture either, but that's because it's (dun, dun, duuuuh...) acrylic yarn. Euro Baby's Babe, which feels lovely but it's um, acrylic. Great for baby stuff (washability) but not so great for behaving itself. I'm sure I'll use this pattern again though. Um...what color work? I can't see it. I also knit a little hat with the same yarn - although I subbed a cream color for the contrast instead of the green which was in hindsight a mistake, but I thought I was out of green (found some more of it after I sent the stuff to T). 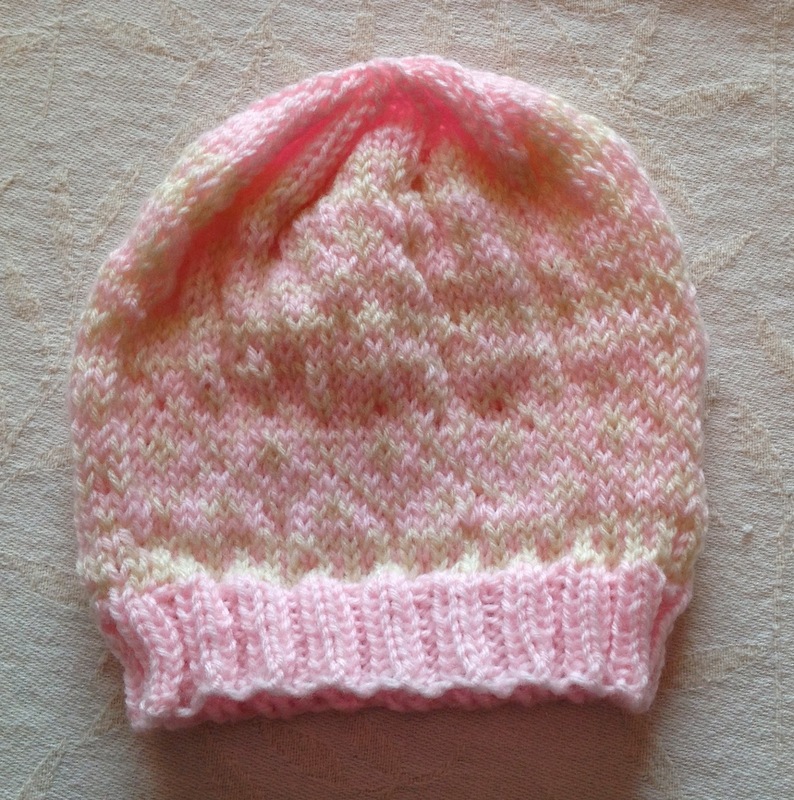 The pattern is a freebie: Two-Colour Infant Hat by Paulina Chin. I actually love this pattern. You get the satisfaction of color work without the headache of a major project. Unfortunately, the cream with the pink kind of muddles together. 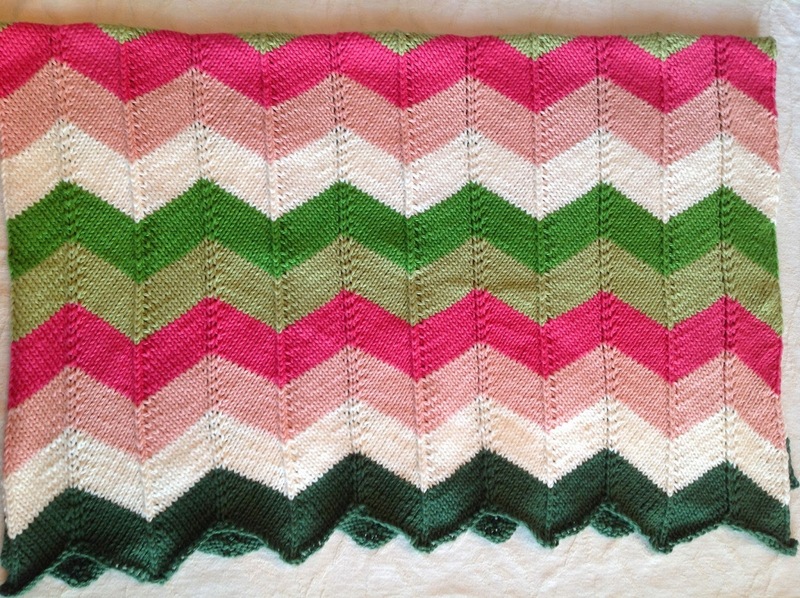 And finally, the item I had the most fun with and that I absolutely love is a Chevron Baby Blanket by Espace Tricot. The pattern is easy but not boring and I am in love with the yarn I used: Knit Picks Comfy Worsted. This stuff is like knitting with a cloud and the color choices are great. I chose pinks and greens (I'm on a pink and green kick at the moment) with some white mixed in. I knit another baby blanket for a co-worker who is expecting a little girl but unfortunately, I was down to the wire with the deadline for the baby shower so I got no pictures. I used another freebie pattern called Summery Diagonal Blanket by Lion Brand Yarns. I used Bernat Baby Jacquard Florals in Morning Glory. 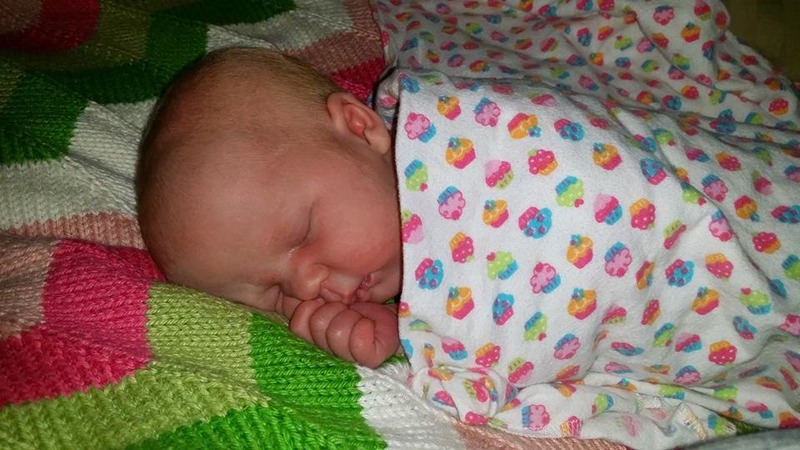 It is an easy knit that produces a pleasing, reversible blanket. It was a hit at the shower. Have another baby on the way to knit for (another co-worker) but I have a few months before it’s needed so in the meantime, I finished my Scott Base Socks. They are still drying from blocking but I’ll post pictures in another post. I’ve also returned to the Lacy Beast. After having finished the first sleeve and blown through the second one, I am at a complete standstill with this thing simply because I’m going to have to use brain cells to continue and those are in short supply these days. The sweater is bottom up and is seamless which makes for a construction that’s different than any that I’ve done previously. 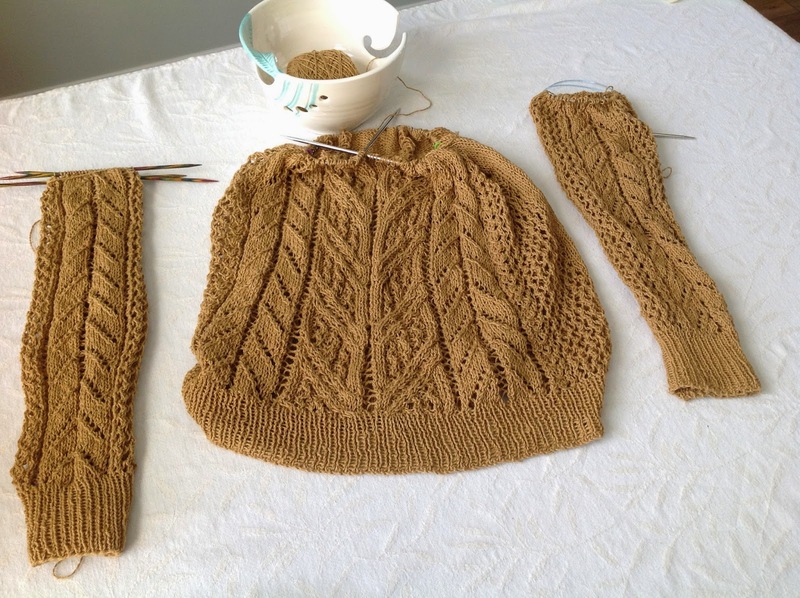 It splits for a v-neck and then joins the live stitches from the sleeves to the body as you knit. I know I’ll do fine once I get started but I’m dreading moving on. There are several comments on Ravelry from other folks who have knit this pattern (those who didn’t throw in the towel) that indicate I’m going to have to fiddle with where I begin my round or I’ll be in trouble. Plus, I’m unable to visualize exactly how the sleeves are joined properly. And so, I’m avoiding. It's not quite as bright as this pic indicates. It’s in the colorway Oceanos. It’s lovely, really. But finding a sweater pattern that will work with such a variegated yarn? Sigh… My only thoughts are possibly the Hepburn Pullover that I’ve had in my queue for a long time. Do you think it would look okay? I realize that some of the stitch detail will get lost in the yarn. Any other ideas? P.S. - To anyone who reads this blog who also has a blog that I follow, please accept my apologies. I am SO behind on my blog reading. You’re all still on my list! Yay! I'll be hoping you find some yarn for it! Would love to see it when you finish! You've obviously been very busy, so many lovely knits! I love that blanket, the colours are gorgeous together. Good luck with the lacy beast! Wish I was busier with knitting (if only I didn't have to work)! :-) Thanks Sarah!